New shipment of goods in shoppe 2! Are you too young to die? Lichs and Dragons give you the heebie jeebies? Well, come and grab a Superior Belt of Fort or Reflex! One of each have been added to shoppe 2. Are you a burgeoning Wizard? An aspiring Sorcerer? Come and get your enhanced Staff from the dodgy looking guy in the red trench coat! Get your Healing Elixirs, Potions of lesser heal, extended protection from the elements! A fine selection of strength enhancing rings +4 (Carry all the stuff you like!) and sparkling diamond amulets. An assortment of crafted cloaks, or if you want to make yourself a +4, ghostly visage scrolls and rage spider silk! Looking to improve your scribing skills? High level spells in packs of 10, ready to go. See something you like but can't afford or you would rather keep your coin in your pocket? I have a reasonable barter system available, pretty purple and blue gems and crafting material highly sort after. In stock today. Speed potions, put a zing in your tail when running away from the scourge! a mere 3k a stack, discount if you want to buy in bulk, just see Dorie in the crafting halls! 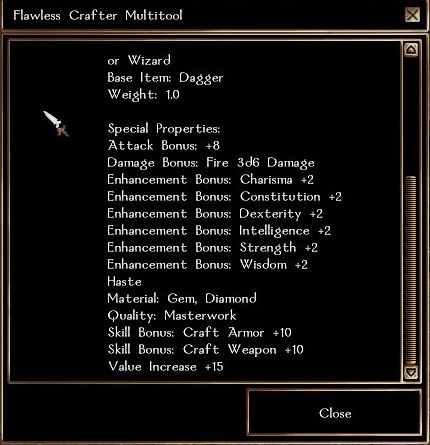 For the discerning crafter, black dragon scale powder, gargoyle skull powder (all freshly ground) and best of all, scrolls of regenerate and flame weapon ready for your next high level craft. See the man in the blue dress! Shop 6 today! Shop 6, now stocking +4 rings of all types! Newly added today, more Restoration potions than you can poke a stick at. See Dorie for a discount on bulk purchases on potions. Don't forget to check out the Healing Elixirs, 10 uses per bottle, heal your friends in battle! Keep them alive so they can be eaten, not you! The higher your heal skill points the better you heal! Crafters paradise, Inks of Illusion and Abjuration (and Divination, but get in quick, they are almost all gone) Don't become a slave to those devil chickens begging them for eggs, buy ready made inks for all your scribing needs. Want to keep your coin in your pocket, generous barter system available, inquire today! New stock in shop #8...Mythic Potions of True Seeing and Faster Learning...stock added as ingredients acquired. Faster Learning Potions now in stacks of 10,5,2 and 1 to service customers needs and make cheaper for the young uns. Added some different rings to shop #9. Specifically Healing and Inner Power rings up to Greater versions. Erasmus is now selling some emergency backup firepower for arcane spellcasters. Brand new! Scrolls of Recall added to shop#8. Handy for saving boat fares. Edon's Premiere Fletcher is now open for business at Shop 11! Plenty of ammunition available at reasonable prices (with the exception of the ridiculously priced Prismatic Arrows) on that note Murrpau will be taking orders for prismatic arrows at a more reasonable price of 30kgp per stack. I have left a few in the store for people to browse their specifications. Please be aware that these are a third level schematic and require a prismatic scale per stack. Murrpau also has a wide range Enhanced Melee Weapons available and Enhanced and Superior Bows. In addition, there are many different boots, helms and gloves available. Murrpau has also crafted many potions for the more experienced and the novice. Potions of Extended BullStrength, Cats Grace and Endurance. Also Stoneskin, Barkskin and Lesser Heals. For the more experienced we have Potions of Heal, Restore and Mindblank. Last edited by southead on 27 Jan 2019, 22:29, edited 1 time in total. Murrpau has decided to slash the price of Prismatic Arrows to 15,000 gp per stack, or 200,000 gp per bag (malar bag included). Haliah has crafted 5 Constructs for sale. Currently asking 1.5 million gp per construct, but am open to trade. See me in game. Trouble with pesky locks and no Rogue handy? Daughter Islay, a Mythic Crafter, has created Scrolls of Greater Unlocking and put some in shop #8. Try them out, might make life a little easier hehe. Murrpau has two Flawless Multi-tools available for sale, These are a Flawless shovel, miners pick, Woodaxe, chisel, skinning knife and weapon all in one! Say goodbye to swapping out weapons forever! These require a Superlative gem, 5 Flawless Diamond's and 3 Flawless Fire Opal's. In the interests of helping others out, Murrpau is willing to let these go for just 2,500,000gp or an arrangement can be made for the trade of Celestial/Abyssal Shards and/or Runes.